These one-year and two-year graduate programs are just what's needed to close the big-data talent gap. Read on to find a school that fits your ambitions and background. It's well documented that there's a big data talent gap, but what's being done about it? What's needed is knowledge and experience. On the first front, hundreds of colleges and universities worldwide are gearing up business analytics, machine learning and other programs aimed at analysis of data in a business context. Data growth is headed in one direction, so it's clear that the skills gap is a long-term problem. But many businesses just can't wait the three to five years it might take today's undergrads to become business-savvy professionals. With that and InformationWeek's readership in mind, there's a great opportunity for experienced information management professionals and even data-savvy IT generalists to fill the talent void. Thus, here's our short list of one- and two-year business analytics and big-data-oriented masters programs in North America. All of these programs are geared to candidates who already have undergraduate degrees, and most favor professionals with three or more years of work experience. In many cases part-time options are available, so students can continue to work as they learn more about big data analytics. This is not a ranking. It's an alphabetical listing of well-known and emerging masters programs specifically targeting the big data analytics talent gap. We've included several of the masters programs at elite schools of engineering where grad-school-supported research programs have sprung up around big data. Columbia, for example, has its Institute for Data Sciences, Harvard has its Institute for Applied Computational Science and the University of California, Berkeley has its AMPLab (which explores the role of algorithms, machines and people in big data analytics). Getting into a masters program at an elite school is no guarantee you'll be tapped for an interesting big data research project working alongside a well-known professor. Nevertheless, graduates of these schools tend to have their pick of future employers. More than half of these schools are offering fairly new masters programs in business analytics. These tend to be interdisciplinary degrees sponsored by schools of business. In some cases it's an MBA degree with a specialization in analytics and information management (see New York University and Rutgers). In other cases it's a focused, business-meets-analytics program that can be completed in one year or less (see North Carolina State University, Drexel, Louisiana State University and Canada's York University). In still other cases, departments of statistics and operations research have dialed up their applied learning to create more business- and big-data-oriented programs (see University of Cincinnati and University of Tennessee). Those specifically interested in big data analytics as applied to marketing should investigate Bentley University and DePaul. Insurance and financial services get special attention at the University of Illinois at Urbana-Champaign, where State Farm has a research center that offers tuition assistance and internship opportunities. Given the number of universities developing business analytics and big-data related programs, a list of 20 schools can't be comprehensive. Thus, our last slide offers links to 10 more masters programs for big data analytics, including new programs at Arizona State, Fordham University and The University of Maryland. 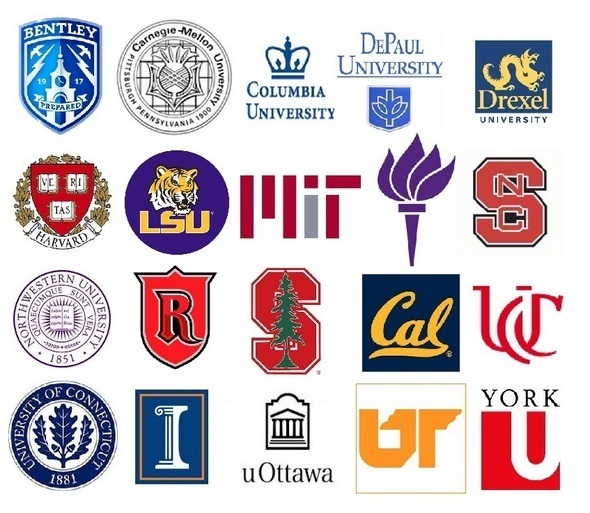 We encourage schools not listed here to add appropriate masters programs using the comment tool at the bottom of the page (note: all comments that include URLs must be reviewed before posting to eliminate spam, so either omit links or count on a delay). It will take some time to fill the big data talent gap, so we'll be updating and expanding this career-development compendium as a service to our readers. A new Master of Science in Analytics degree at Wittenberg University's Business School will be offered in August 2016. The program will be a cohort-based degree program. The State Council of Higher Education for Virginia approved a new Master of Science in Business Analytics degree at William & Mary's Raymond A. Mason School of Business. The residential-based degree program will launch in August 2016. W&M's one year master's program promises to address the growing demand for data science talent. The program is designed to give students the advanced skills necessary to help businesses use big data to gain a competitive advantage. The program will provide comprehensive coverage of analytic methodologies with a focus on four skill areas: business acumen, applied mathematics, computing technologies and communicating with impact. The curriculum will include coursework in data visualization, optimization, algorithms, database management, machine learning and probability and statistics. "We designed the program to enable our graduates to ask the right business questions, identify the real problems, build the right models, analyze those models using the right methodologies and successfully interpret and convey the results to business managers," said Jim Bradley, lead faculty sponsor for the program. "Graduates of this program will know how to communicate results in plain, managerial terms that are relevant and effective in business settings." [email protected] prepares data science professionals to understand, manage and analyze large data sets, as well as communicate the results. Blending the flexibility of online learning with an interdisciplinary curriculum, this Master of Science in Data Science program allows students to benefit from Southern Methodist University's connection to the global business community without having to relocate. Professors from the Dedman School of Humanities and Sciences, the Lyle School of Engineering, and the Meadows School of the Arts collaborated on the curriculum to create a degree that gives students foundations in data science that can be applied in many different areas. In 2014, the School of Computing Science at Simon Fraser University launched the Professional Master's Program in Big Data. This hands-on program is intended for students with some programming experience who wish to learn more about the state-of-the-art in data analysis. As there is no research component, the M.Sc. in Big Data is geared towards students who wish to prepare for an exciting, well-paid career in the data science industry. Questions? Contact bigdata@sfu.ca referring to this article. The definition of big data holds the key to understanding big data analytics. According to the Gartner IT Glossary, Big Data is high-volume, high-velocity and high-variety information assets that demand cost effective, innovative forms of information processing for enhanced insight and decision making. - Volume refers to the amount of data. Many factors are contributing to high volume: sensor and machine-generated data, networks, social media, and much more. Enterprises are awash with terabytes and, increasingly, petabytes of big data. - Variety refers to the number of types of data. Big data extends beyond structured data such as numbers, dates and strings to include unstructured data such as text, video, audio, click streams, 3D data and log files. -Velocity refers to the speed of data processing. The pace at which data streams in from sources such as mobile devices, clickstreams, high-frequency stock trading, and machine-to-machine processes is massive and continuously fast moving. The University of San Francisco offers a one-year MS in Analytics. It is an intensive one-year (July-June) program that provides students with the skills necessary to develop techniques and processes for data-driven decision-making. The program covers topics such as data mining, machine learning, statistical models, predictive analytics, econometrics, optimization, risk analysis, data visualization, business communication and management science. USF's Analytics Program is highly technical and students write R and Python programs for most of their courses. Throughout their program, students work with an industrial partner in the practicum to gain real world experience. Pre-requisites include: a bachelor's degree, courses covering programming languages, inferential statistics, calculus, linear algebra, and a social science, and either the GRE or GMAT exam. Don't forget Bond University on the Gold Coast. They offer a digital business degree that covers all of the necessary topics and drill down into data science, big data, programming, systems design, cyber security, etc. Plus the course is offered over 3 semesters per year so the course is over in 2 years. They have strong links with Australian businesses and almost all grads land a great job straight from Uni...there is a lot of demand for data scientists in QLD at the moment and most jobs pay > $150k pa.
For more information, please visit BGSU websit. I am looking to do Masters of Business Analytics. I am just concerned with the quality of programs in Australia and the best universities to do with. As far as I know there are only few in Australia that provides this degree, namely Deaking, Melbourne Business School, Victoria Uni, RMIT. I am just not sure on how to go ahead with either of them as there is no performance information, existing alumini you could speak to, rankings, etc that usually helps a student to make a decision.